Raise your hand if you live in the United States and think you have bad traffic. Now put your hands down. Compared to Cairo, you have very good traffic. It may take you a long time to get to work, but in your world there are traffic lights, crosswalks, and some semblance of order. The only order you experience in Cairo are the laws of the vehicular jungle. I seem to remember some pretty bad traffic in certain cities around the world, but Cairo stands out for its sheer anarchy. Cairene conveyances are not unlike those in other developing countries. There are taxis and private minibuses that stuff themselves so full that people hang outside the open door like tourists on San Francisco cable cars. There are also donkey carts, big, bad tour buses, bicycles, mopeds, LOTS of pedestrians, private cars, and there are now tuk-tuks, an import from India. These moped/rickshaws are entirely unlicensed – if one of them hits you, good luck trying to get satisfaction. There is no auto insurance to speak of, and people are left to work it out if they have an accident. It’s utter chaos. You could go all day and not find a car without a dent. There are some really good things about getting about in Cairo. Taxis are dirt cheap. The flag drop is three Egyptian Pounds, or forty two American cents. A trip from downtown to our apartment takes anywhere from ten to forty minutes, depending on traffic, and costs about two dollars with tip (I always give the cab drivers a tip and they seem genuinely grateful). Getting the cab to take you there is another story. We were advised to make sure that the cab driver always turns on the meter. Most will, but some will tell you it’s broken, or come up with some kind of story about why the meter is a bad idea. Apparently, this is a chapter in the International Cab Driver’s Union Handbook. When that happens, you’re supposed to make the driver stop the car and just get out of the cab. One day last week it took us three tries to find a cab driver who would turn on his meter. Then there’s the matter of the destination. Fortunately, our apartment is near a spot known to all cabbies – Kit Kat Square (yes, that’s what it’s called). The amusing part is that there are no hotels near us and cab drivers are highly entertained that we want to go there. One actually laughed at me. My guess it’s as if a tourist hopped into a cab and told the guy to take him to Riker’s Island, or Cleveland. If the lines in the street are the equivalent of a coloring book, drivers in Cairo are Jackson Pollock. The flow of traffic is an organism unto itself. Drivers weave in and out, sliding from lane to lane, poking through the briefest of openings while they have the chance. The Cairene driver is not just a painter, but a musician. The horn is his instrument (and I mostly mean his – most of the drivers I saw were men). Cairo drivers toot their horn to let you know they’re coming, they beep it to remind you to stay out of the way, they honk it to signal discontent, and they will also tap out a tune from time to time, seemingly out of boredom or maybe just sheer creativity. One day we were heading back to the apartment after a day downtown. There was a brief, rare, blissful moment in which our taxi was all alone for at least a hundred meters. There we were, with the road to ourselves. What did our cab driver do? He honked his horn. Maybe it was a reflexive act. Maybe he was just making sure it worked for the moment, in anticipation of ten or twenty seconds hence, when he knew he’d need it. No matter. It was an auditory transportation non sequiter. The music of the streets, which we can hear quite clearly from our houseboat on the Nile, and which seems to amplify the sounds of the traffic as it bounces off the face of the water, is like an Ornette Coleman composition. At first it sounds simply like noise, but if you listen carefully, you will find that it most definitely develops a rhythm. It somehow makes sense. There are no two ways about it, this is music. Sometimes, the tune is catchy. One driver will tap out a rhythm on his horn (boopedy boop boop, boopedy boop boop) and another will join in, and another, until you have an impromptu automotive symphony. In any event, just wandering down the street to the market on any given day is an exercise is sensory overload. If you need to cross the street, it also becomes a test of survival. We had one episode in which we had to make it across six lanes of two way traffic. Janine was a bit tentative, and I was too bold – never a very good combination. I confidently stepped off the curb and was halfway into the street when a motorcycle came out of nowhere and nearly ran us down. We retreated back to the curb in flinching self-defense. Janine was more than traumatized. It reminded me of the time when we gave in to our daughter Maggie’s desperate desire to have her ears pierced when she was about five. The problem was that the ear piercing shop only had one person on duty, so they had to shoot the earring stud gun into her earlobes one at a time. Well, these stud guns make a lot of noise, and the first one sent her into a frenzy of tears and recrimination. It took at least a half hour of cajoling to get Maggie to agree to endure the horrifying process of driving a second hole into her other earlobe. That was how Janine felt when she saw her life flash in front of her eyes in Cairo traffic. After a fair amount of suffering, she finally braved the traffic and made it across, but I suspect she’ll carry the moment with her for years to come. Cairo is not for everyone. In fact, it might not be for most people. For one thing, it’s a developing world country with all that goes with it. Garbage is everywhere. Sidewalks, not so much. The country is also on edge, with well-armed police and army everywhere. 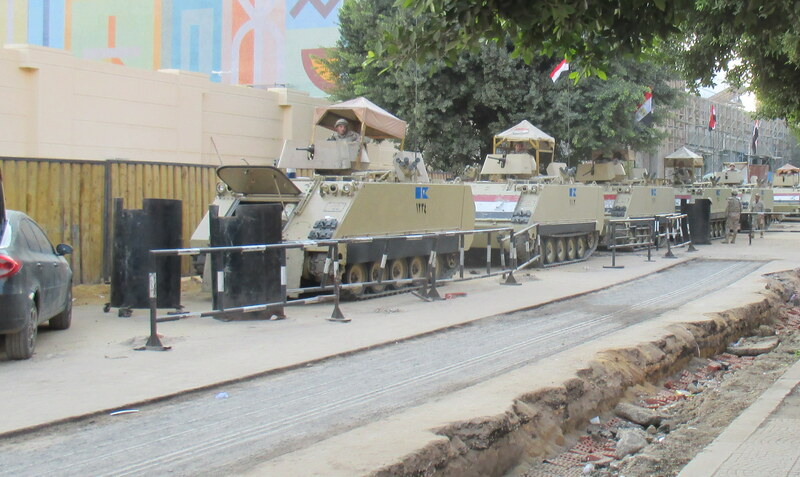 Outside the Egyptian Museum, which sits at the edge of Tahrir Square, the epicenter of the recent revolutions (the one to depose Mubarak, and the other to depose Morsi), there is a line of tanks, with soldiers on high alert. Long strands of barbed wire blockades are staged at the sides of the roads, ready to be rolled into place at a moment’s notice. In a poor country, public services are catch as catch can on their best day. One person I spoke with talked of the lack of public space in this city. For example, there are few public playgrounds. The wealthy can buy access to private ones, but poor kids play in the street. Public parks are rare. It’s no wonder that much of the place appears to be treated as a no man’s land where people toss garbage, relieve themselves, or otherwise discount the value of having a clean, well-organized common resource. It was always nice to get home. To get to our houseboat, we pass through a simple unlocked wrought iron gate. Inside our gate, the space was ours, and the chaos of the city was reduced to a thrumming pulse that was over there, while we were over here, down by the river, separated from the madness. Cairo is not the easiest place in the world to be a tourist. 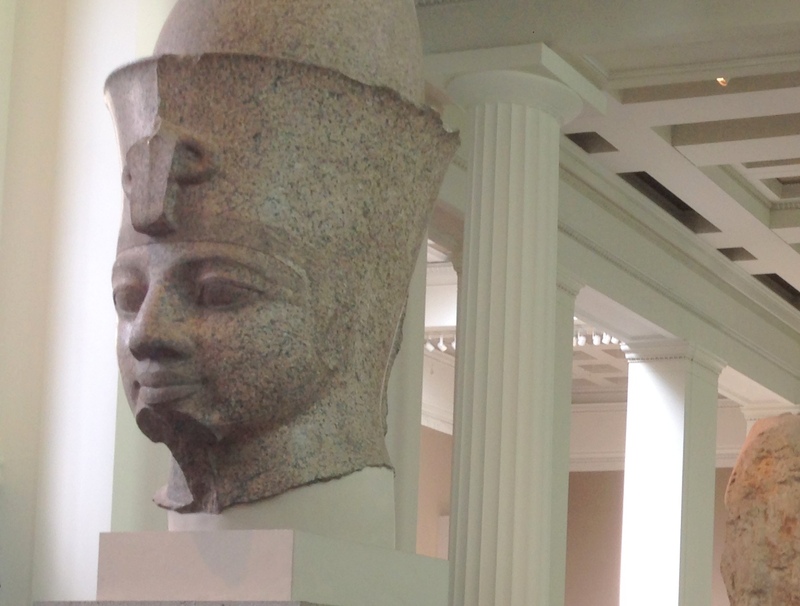 Unlike in many world capitals, westerners in Cairo are a great big curiosity. With my mishmash of European genes, locals have asked me for directions in Rome, Athens, and even Istanbul. Not so in Cairo, where we really, really stand out. Perhaps it’s because there are so few of us after the revolution. Perhaps it has always been the case. 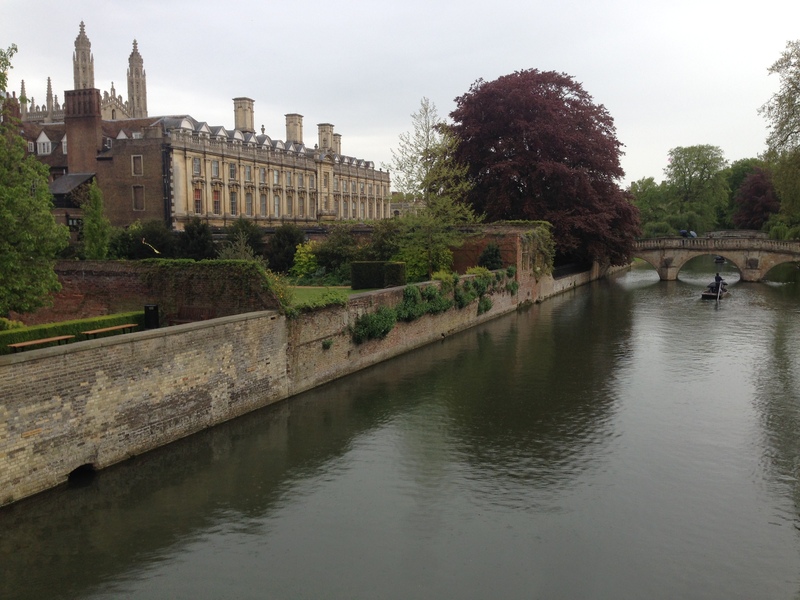 But to walk down any street in town is an exercise is being a very big goldfish in a teeny, tiny bowl. I wasn’t terribly bothered by it, but Janine was regularly made quite uncomfortable by the attention she attracted, especially from men. Janine said that she understands why a woman would want to cover herself completely in a culture that seems so polarized by gender. Then there are the touts. If you look like a foreigner, you won’t get far before someone starts talking to you (at best), or aggressively attempting to sell you something (at worst). Or, like the squeegee guys around the Holland Tunnel, someone will begin to provide a service (like pointing out that the pyramid is a pyramid) that you neither asked for nor need. At the so-called “bent” pyramid in Dahshur, just outside of Cairo, Janine and I had the entire place to ourselves. At one point, one of the two fellows guarding the site (who was packing a very intimidating looking automatic weapon) began following me around the area. 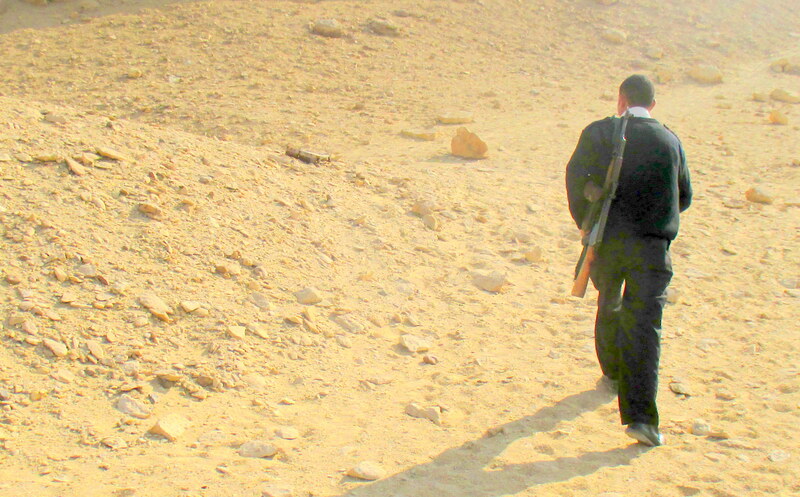 My guide at the bent pyramid at Dahshur. 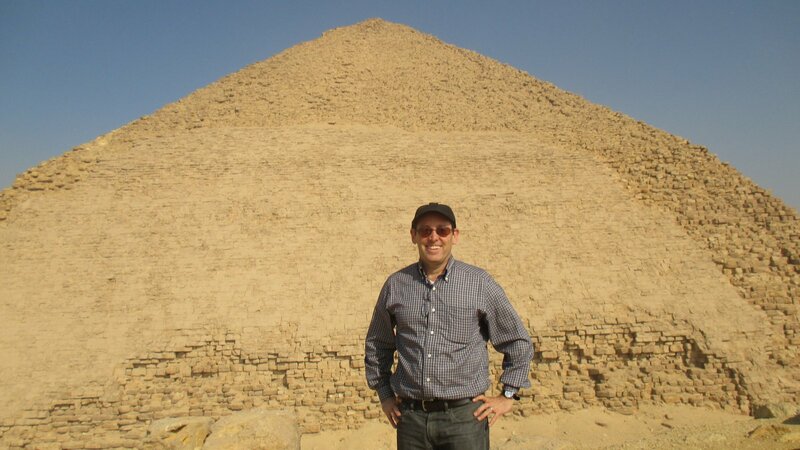 Your humble correspondent at the Bent Pyramid in a photo taken by my pistol packing pal. Unnerved, Janine retreated to our guide’s car. Silly me, I wanted a better angle to take a photo, and found myself being tracked by my new friend. He may have been toting some serious firepower, but I could also see his socks through his cheap cracked cardboard shoes. He began pointing out some very simple elements of the pyramid, and I could see where this was going. Whether I liked it or not, I would be tipping my well-armed but underpaid new friend. You basically have two choices for how to respond – you can get frustrated or even angry, or you can go with it. I must confess that sometimes I feel charitable, but sometimes I feel manipulated. It’s not like wandering the streets of Rome or Paris, in which you will be left to your own devices no matter what. In Egypt, you are what’s for dinner. Anyway, I suspect that the pyramid touts are members of the Associated Squeegee Guild, or some such august institution. 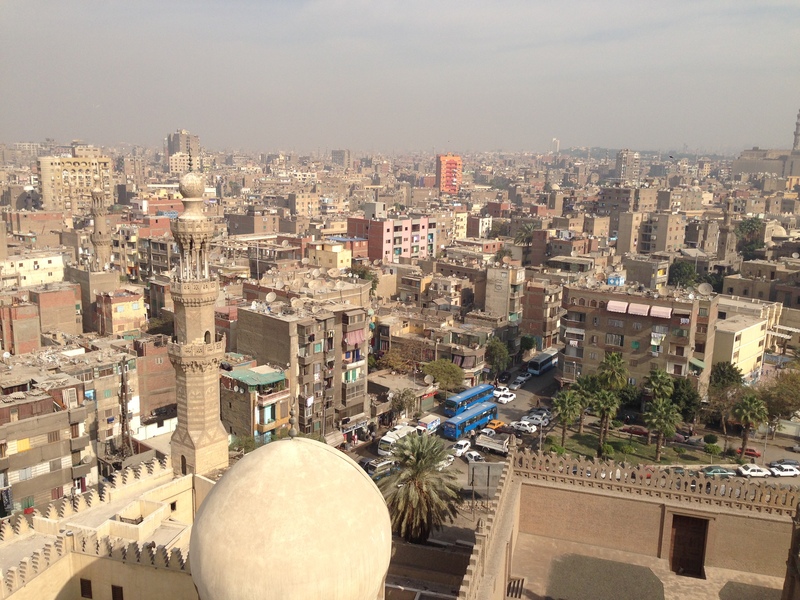 The view from the top of the minaret at the Ibn Tulun Mosque in Cairo. The view was well worth the small tip I gave the fellow who unlocked the door to the minaret. By this time you may be asking why anyone would come to Cairo. What with the traffic, the garbage, the unwanted attention, the smog (the air is really bad), and the poverty, why subject yourself to such challenges when you could sit in French cafes or on a Caribbean beach? My answer, believe it or not, is that it’s actually all quite wonderful. The call to prayer is a perfect example. Each morning at 5:15, it wakes you with a start, even with the best earplugs. But it’s charming, atmospheric, and deeply meaningful to the faithful, who worship in a way that most Americans don’t understand. It reminds you that you are far from your comfortable life and that you are a visitor in a strange land. And it’s really quite beautiful, even if you’re trying to sleep. I really like that. Next time – thanks for all the atmospherics, Eric, but will you ever tell us what you saw and what you ate?